Term 1 has flown past and we wish all of our members a safe and happy break filled with lots of Easter chocolate! The final date of this term is Saturday the 5th of April. Here is a quick update, including some important upcoming dates for you to put in your calendar. The Aerobics competition season is well and truly underway, with Aerodynamix hosting the first invitational competition of the season. The event ran smoothly, and was an amazing showcase of what our athletes here at Aerodynamix have to offer. The Aerodynamix Invitational enabled athletes from Victoria and South Australia to show off their routines in front of an audience, as well as get some valuable feedback from the judges in preparation for the upcoming State Team Trials. The Victorian State Team is selected based on athlete performance at trial events. A panel of judges is responsible for selecting the top eight athletes in each level and age division to represent our State at the National Championships in May. On Saturday, the 16th of March, the Aerodynamix Aerobics team competed at the Victorian State Team Trial 1. Our athletes did us proud, with each athlete beating their previous scores from the Aerodynamix Invitational. Aerodynamix hosted the AER State Team Trial 2 on Sunday, the 31st of March. It is a privilege to host this standard of event and we could not have been happier with performances on the day. We now eagerly await Gymnastics Victoria’s announcement of the State Team. Our Level 7 ALP athletes have been working hard in preparation for the Victorian Qualifiers. This event took place on Sunday, the 24th of March at Eureka Gymnastics, in Ballarat. Abbie, Georgette, Ellen and Caitlyn competed in the first of three qualifying sessions in the 14 years and over, Division 2 section. Well done to all of the girls and their performances on the day. Highlights include four beautifully performed artistic floor routines, Abbie’s tumbling upgrade, Ellen’s spectacular beam dismount, Georgette’s creative beam mount and Caitlyn’s vault. Special congratulations goes to Caitlyn Farvis who has qualified through to the Victorian Championships. Caitlyn will compete on Saturday the 13th of April at The Geelong Arena. We wish her the best of luck!!!! Our GymStar coaches have created a set of brand new floor routines for our level 4-6 athletes. They look fantastic and we can’t wait to get everyone started first thing in term 2! A special thank you to Chloe Waterhouse for joining our coaching team on this project. Chloe is a level 6 athlete and was invited to choreograph the new level 6 floor routine based her own outstanding performance in 2018. Save the date! June 23rd has been set for our Club practise event. This event is designed for everyone to get a good feel for how much fun competing can be. Competing also helps our athletes with goal setting, resilience and to develop a positive mindset. GymStar families will receive more information regarding competition opportunities against other Clubs by email early in term 2. We love using themes as they spark imagination and give meaning to movement. A favourite story this term has been our pirate adventure. We dressed up our monkey bars as a pirate ship and the children enjoyed climbing aboard, swing from the rigging, stealing the pirates treasure and escaping with the loot. They walked the plank, swam over huge waves and hoisted the pirate flag! This little bit of story magic brought so many smiles and certainly made remembering all of the skill stations a whole lot easier. Each of our themes runs for three weeks. This enables the gymnasts to get familiar with skills covered in each of the themes by allowing a week for introduction, a week for consolidation, and a week for extension. This ensures that each of our gymnasts can learn, create good habits, and develop the skills. 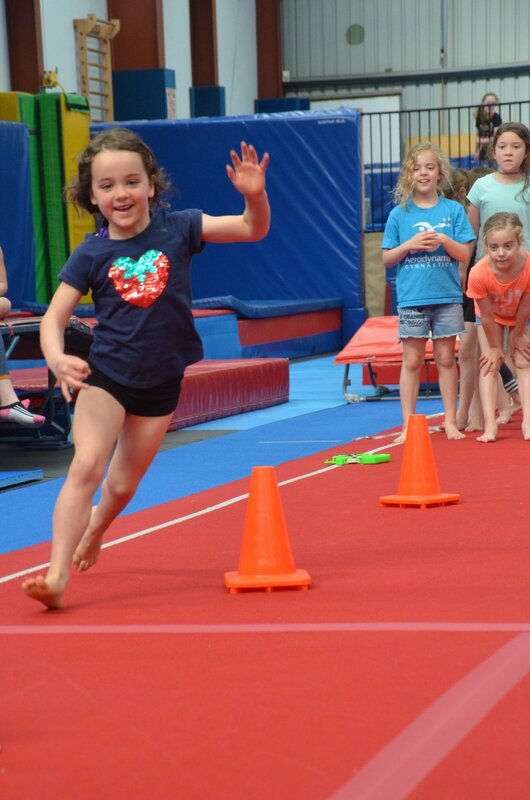 We love welcoming new members into our team and are passionate about sharing the benefits of gymnastic movement during this important developmental stage. If you have a little friend who might like to join us, direct them to follow our Facebook page for semi regular new member promotions. When people first notice the enormous contraption that we installed over the Christmas break, their eyes light up immediately! To kids and adults alike, our monkey bars bring a smile, along with a feeling of anticipation for some challenging fun ahead. These monkey bars are a great way to change up our athlete’s usual strength and conditioning program. They can be used for developing upper and middle body strength, shaping, agility and coordination, as well as being fun for athletes to swing and play on! We can also dress up the monkey bars to suit the theme of our Kindergym program. It was so much fun to see the bars set up for our jungle theme - with monkeys hanging from the rope and rings, and toucans flying from the highest rails. The toucans were a great prop to help our Kindergym children understand the concept of driving their swing. They were delighted to see their feet stretch up towards the toucans and excited to feel their swing getting higher and higher. 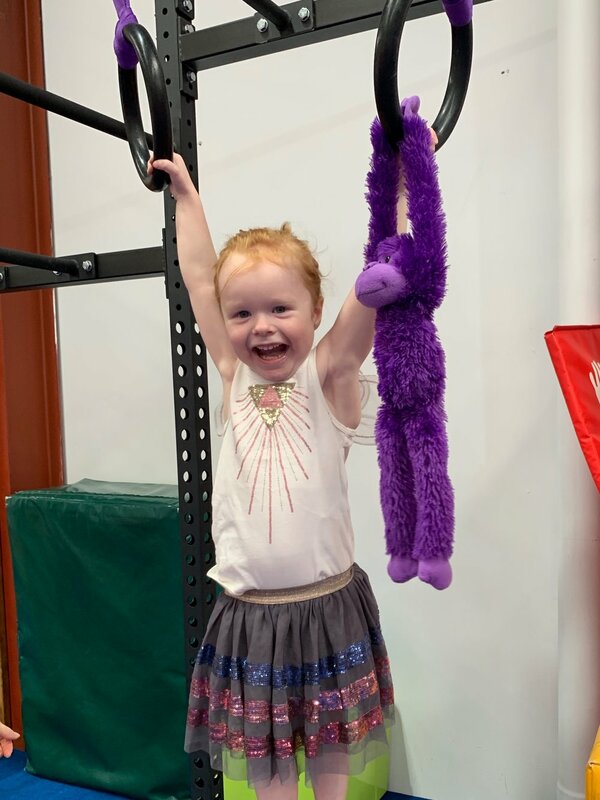 This functional piece of equipment provides limitless opportunities for all ages and we love seeing children building their resilience by trying again and again to get to the end of the obstacle course that we have set for them. Look out for some new challenges in the set up during term 2! At Aerodynamix we run a leadership program for past and present gymnasts who are 14 1/2 years of age or older, and who are interested in pursuing a coaching pathway. This year we have had an outstanding turnout, with ten past and present gymnasts signing up for the program. Throughout Term One, our leadership program coaches have had the opportunity to shadow some of our qualified coaches in a variety of Saturday classes. The next step in their education is to buddy up with a qualified coach and assist that same class each week. The aim of the program is to introduce and develop skills such as organisation, communication, leadership and of course coaching! The leadership coaches have regular tasks to complete, and then they will undertake their Beginner Coaching course later in the year. 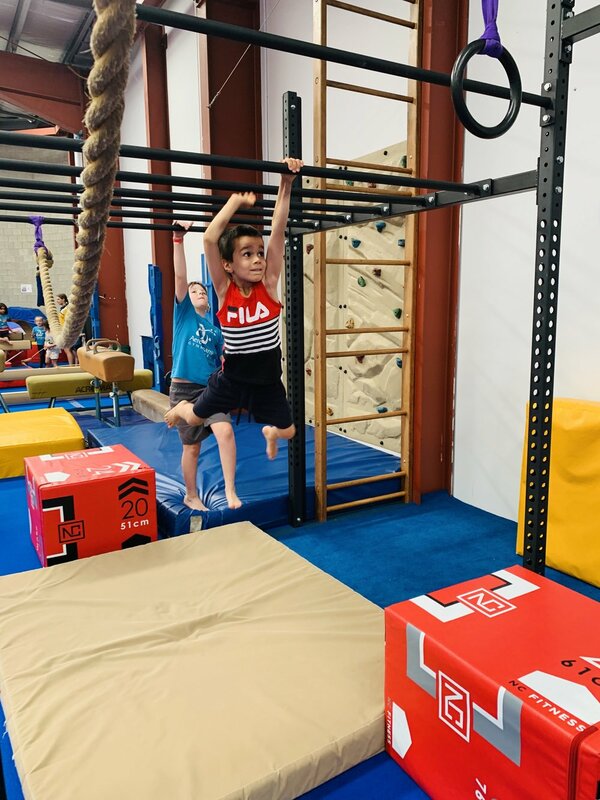 We know that school holidays can go for what seems like a lifetime, so in order to ease your boredom before you head away for Easter, we have organised a number of Casual Open Gyms and Structured Sessions here at Aerodynamix to get your little gymnasts out of the house these holidays. These programs are open to everyone! Follow this link to secure a spot in one of these sessions. On Saturday, the 13th of April from 6pm-9pm we will also be hosting a Pyjama Party here at Aerodynamix. Pack your PJ’s and get ready for a fun night of swinging and bouncing, pizza eating, and movie watching! Be sure to book in quick because you will not want to miss out on this one! 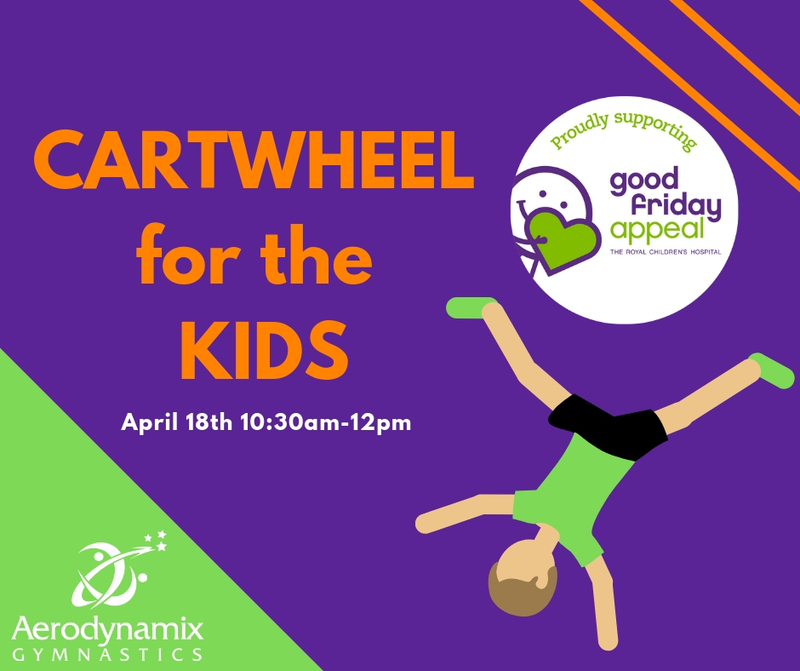 This year, Aerodynamix will be supporting the Royal Children’s Hospital Good Friday Appeal. Come along on Thursday the 18th of April for a fun morning of climbing, bouncing, balancing, swinging and cartwheeling! Everyone is encouraged to join in the fun, and to wear purple and green to show their support! Our fundraising target is $500, with all funds raised going straight to the Royal Children’s Hospital. Entry for families is $20. Book here to secure a spot! Term fees are adjusted according to the number of training weeks in each term. Your term fee takes into account the following dates on which classes will not be held. In Term 2, Aerodynamix will be hosting our annual Aerobics Display Night. This will be our Aerobics levels athletes first chance to show off their new routines for the competition season, as well as an opportunity for some of our new Aerobics athletes to perform their routine in from of an audience for the first time ever! This event will run in the evening on Saturday, the 25th of May. We encourage all of our members to come and support our athletes out on the floor.